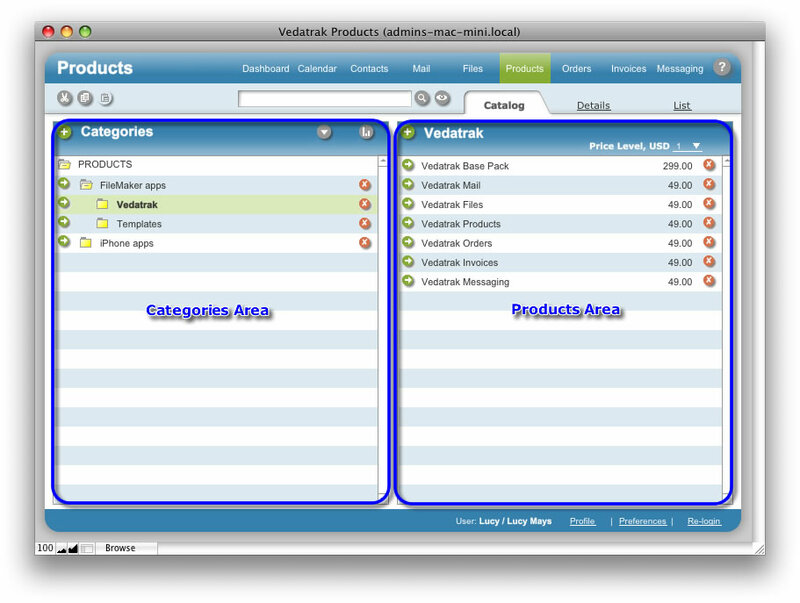 Products Catalog View allows users to organize products using different categories in an easy to use tree format. The Categories Area displays information about categories in a hierarchical format. To create a new category, click New and enter the category name. To edit a category, click Edit/View next to the category. To delete a category, click Delete to the right of the category. To sort the categories, use the Sort Custom button and use the arrow buttons to arrange the category list. Use Cut, Copy and Paste buttons in the Tool Bar to change the position of categories in the list. The Products Area displays information about products in each selected category. To create a new product in a selected category, click New . To edit a product, click Edit/View next to the product. To delete a product, click Delete to the right of the product. To display prices at different quantity breaks, use the Level Price drop down list. Use Cut, Copy and Paste buttons in the Tool Bar to copy or move the products.